Aizawl/Agartala, Jun 5 : The repatriation of over 40,000 tribals, who took refuge in Tripura about 16 years ago after ethnic disturbances in Mizoram, has not been resumed, officials said. Although the union home ministry had issued instructions to resume the repatriation of Reang tribal refugees from northern Tripura to western Mizoram this week, both Tripura as well Mizoram government officials have blamed each other for the delay. “The repatriation would restart after the Tripura government communicates its preparedness to the Mizoram government,” Mizoram home department Joint Secretary Lalbiakzama told reporters in Aizawl Monday. “When we approached the Tripura government officials in May, we were told that the conduct of identification of the refugees jointly by the officials of the two governments could not be taken up due to unconducive situation in the areas around the relief camps in northern Tripura,” Lalbiakzama added. “We have nothing to do except to wait for response from the Tripura government,” he said. However, Tripura government officials Tuesday denied Mizoram’s claim and said they were always ready to cooperate in repatriation of the Reang tribals, locally called Bru. “Our officials are always ready to extend all kinds of cooperation and logistical helps to Mizoram officials to send back the tribal refugees to Mizoram,” North Tripura District Magistrate Prashanta Kumar Goel told IANS. In view of the growing ethnic troubles, the Tripura government has been telling the central government that the stay of tribal immigrants from Mizoram was causing troubles in the state. Refugee leaders, however, have been insisting that without a formal agreement between the Mizora, Tripura and the union governments and tribal leaders, the rehabilitation of refugees will remain uncertain. The issue was also discussed at the chief ministers’ meeting with union Home Minister Sushilkumar Shinde in New Delhi in April. The matter is expected to come up again at the chief ministers’ meeting on internal security in New Delhi Wednesday. Tripura Chief Minister Manik Sarkar had told the meeting that the continuous presence for over 16 years of about 40,468 tribal refugees from Mizoram had been a matter of concern for his state. 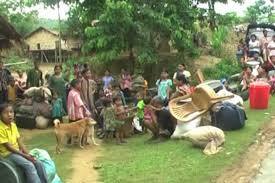 “The long stay of the refugees in Tripura has its own socio-economic and law and order implications. The state government is providing necessary support for early repatriation of these families. However, the process has been extremely slow,” Sarkar had told IANS. The refugees, lodged in camps in northern Tripura, 180 km north of Agartala, have sent several memoranda to the prime minister and union home minister besides organising protest rallies in support of their 18-point demands. The Reang tribal refugees have taken shelter in six camps in Tripura’s Kanchanpur sub-division, adjacent to western Mizoram, since October 1997. After continued persuasion by the Mizoram and union home ministry officials, around 4,500 refugees returned to their villages in 2010 and 2011. However, the process has been stalled after that.